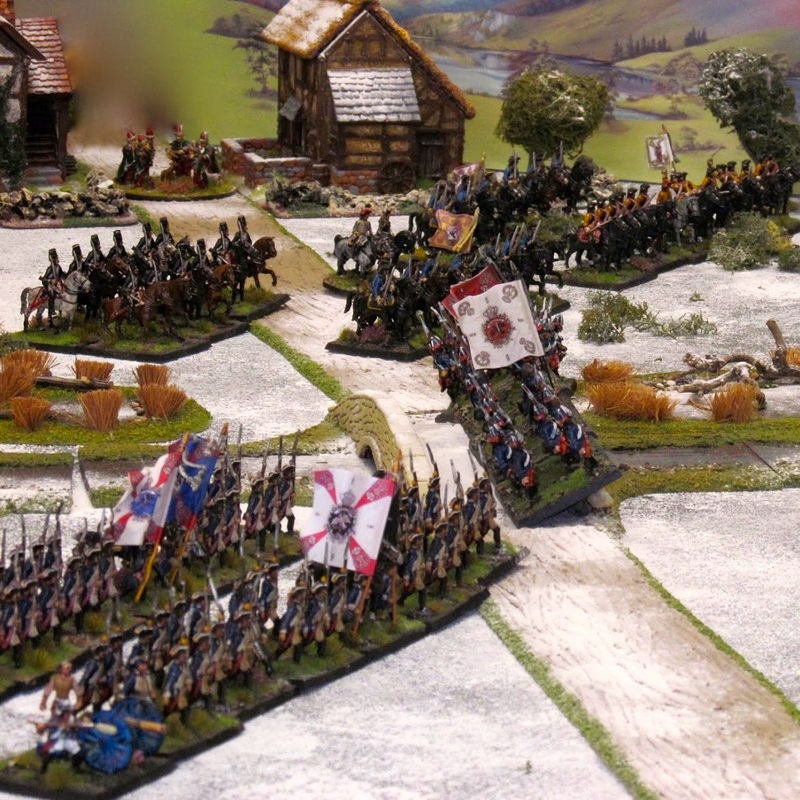 This week's game was the delayed but much anticipated Battle of Fontenoy. Paul T organised the game and brought his glorious and venerable collection of 15mm War of the Austrian Succession armies and set up on my table. Paul doesn't possess every regiment that took part in the WAS (but nearly does) so some units were reflagged for the day. All the terrain pieces, buildings etc were scratch built by Paul. We were joined by Conrad Cairns, Dave Jarvis and Paul Stevenson. Conrad and Paul S were the Allies while Paul T and Dave were the French. I was going to play but in the end decided to umpire and offer impartial advice on the rules, (Honours of War), mainly to the Allies I have to say 😉. Also, I was (and am) still rather sore so my role of Quartermaster (coffees and lunch) was more important. The Allies were saddled with Cumberland as their C-in-C who Paul made 'dithering'. The French were led by the 'dashing' but unwell Marshal de Saxe in his perambulator as he was suffering from an attack of Dropsy. The French army deployed ready to engage the Allies who had a tough task ahead of them facing entrenchments and fortified villages along almost the entire front. The Allied plan was to move all the Dutch and assorted Austrian and Imperial troops on the left, where they were facing three redoubts and a fortified village, to the centre in order to support the main attack. 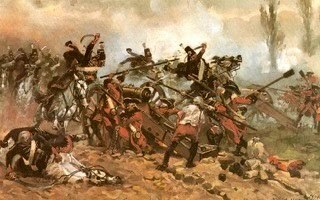 The English and Hanoverians were tasked with making a frontal assault on the French centre while the remaining Dutch were to assault Fontenoy itself. Fontenoy and its supporting redoubts, with infantry, cavalry and dismounted dragoons to the rear. The Allied left. All of these troops were ordered to march quickly to the centre, but Conrad managed some dreadfully unlucky command rolls and it took them far longer than was expected. The French centre, with the Gardes Francais, Gardes Suisse and various others including a couple of Irish battalions in the far distance waiting for the Allied assault. The main Allied thrust about to head off towards the French. Another view of the French centre, before things started to get messy. The English and Hanoverians move through the screening horse and begin to deploy into line. 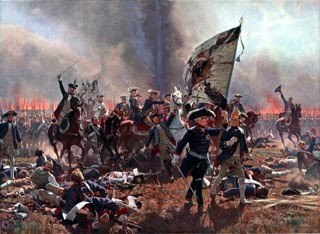 The Hanoverian battalions in the foreground were caught by artillery in Fontenoy before they could form line but were fortunate to get away with minimal casualties. The Anglo/Hanoverian advance seen from behind the French centre. The English were by now taking casualties but still kept coming on. Austrian and Dutch horse on the Allied left screening the passage of the infantry from the extreme left towards the centre. Some unfortunate command rolls and mounting casualties forced the English to slow their advance, but the Hanoverians pressed on with the lead regiment taking refuge of sorts in the sunken road. The Gardes Francais were pounded by musketry and close range canister fire and the right-hand battalion was driven off (they ran away). Meanwhile the Dutch had launched their first assault on Fontenoy. The garrison's defensive fire was so effective that one attacking battalion was broken before it could close (the blue one in the centre of the picture) and the other was driven off after failing to gain entry to the heavily fortified village. 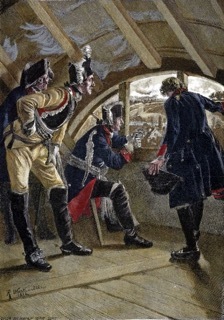 The French garrison of Antoing. Apart from a couple of long rantge shots with their artillery at the start of the battle they were able to sit back and enjoy the spectacle. The French seem to have developed a habit of positioning their heaviest artillery out of the way across an impassable river. They were wasted as they only had the opportunity for a couple of shots before the Dutch and German infantry opposite Antoing marched off to the Allied centre. The second assault on Fontenoy about to go in. This time the Dutch are successful and push the French out. The three French redoubts between Fontenoy and Antoing. These were largely ignored by the Allies, although the one closest to Fontenoy was cleared of its defenders by a combination of grapeshot from its front and musketry from its flank. The English have almost closed with the French while the surviving Hanoverians are exchanging point blank fire with the French Guard. Allied horse have advanced to fill the gap in the French line now that Fontenoy had fallen. The Allied horse wheeled into the flank of the Gardes Francais and sent them streaming to the rear in disarray. Pursuit would have been suicidal so the victors withdrew. While the Gardes Francais were being seen off, the French and Allied horse clashed. The Allies were initially successful but numbers told in the end and they were driven back. This left a rather large hole in the centre of the battlefield which was about to be plugged by more Allied horse. In the distance the English foot was causing crippling casualties on the French, and although their own losses were high they were able to rally, shrug them off and rejoin the fight. 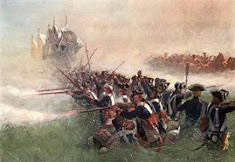 With support from fresh horse to their flank the Dutch captors of Fontenoy sortied out and formed up to threaten the remaining French horse and dragoons. Not wishing to be crippled by close range musketry the French horse and dragoons on their right pulled back out of range and rallied their shaken units. Over on the far Allied right the Highland Regiment had been slowly pushing the Arquesbusiers de Grassins back through the Bois de Berry. Eventually the latter decided that they'd had enough and dispersed, giving the Allies an opportunity to attack the redoubts from the flank as earlier frontal assaults had been costly failures. At this point, after nearly five hours of play and around 15 turns (I lost count in the mid teens) we called it a day. Technically it was a narrow French victory as the Allies failed to cause sufficient damage on their army and force them to retire, but the Allies could and did also claim a narrow victory as they'd captured Fontenoy, had devastated the French centre and most of the English foot were still a fighting force. There were also fresh foot and horse in support. An interesting and challenging game. It would have been very different if some of the many Allied failed command rolls early on had been successful but we shall never know. Honours of War coped well with a big game again. Thanks to Paul for organising it and bringing the troops and to Paul, Conrad and Dave for coming up to the 'wilds' yet again for a game. 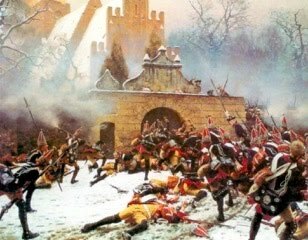 Next time its the Battle of Rocoux. An intense and great looking game, congrats to the French! Your Fontenoy is a handsomely impressive looking game. Add to your day's role as battle photographer. Excellent,sweeping battle vistas. Now that is a grand looking fame Colin! The usual fine AAR and photographs. It seems you are on the mend! An excellent looking game and some lovely scenery too boot. A narrow French victory? My eyes seem to see a different outcome. Fontenoy is captures - you hardly ever see that happen- and the French center is crushed and the Bois de Barri captured. My goodness, what else must this Allies do to call it a victory? Capture Paris too? Well it was only a 'technical' French victory as they had actually slightly fewer losses and had more fresh uncommitted troops left than the Allies, who could claim a moral victory as a result of them doing far better than in the real battle. Nonsense Monsieur. The Bois de Barri Manilow was at least 'contested' as your Arquebusiers du Gratin had melted away! I'm with Jim - your narrative reads like it should be a certain Allied victory compared with the historical outcome. Good to see the Dutch earn their pay in this one! The classic 15mms look fine, I started off with Peter Laing too, but then Minifigs brought out their Napoleonic range. I shall check the cctv! Great Batrep!! Game looks great too!